Ingredients: Water sufficient for processing, shrimp, salmon, tuna, pea protein, modified tapioca starch, chicken fat, goat milk, tricalcium phosphate, salt, potassium chloride, iron glycine complex, choline chloride, sodium bicarbonate, magnesium sulfate, zinc glycine complex, beta-carotene, taurine, manganese glycine complex, vitamin E supplement, copper glycine complex, niacin supplement, thiamine mononitrate, sodium selenite, vitamin A supplement, vitamin B12 supplement, pyridoxine hydrochloride, calcium pantothenate, riboflavin supplement, biotin supplement, potassium iodide, vitamin D3 supplement, folic acid, menadione sodium bisulfite complex. According to our data, this Solid Gold recipe provides complete & balanced nutrition for all life stages. In other words, this formula is AAFCO approved. 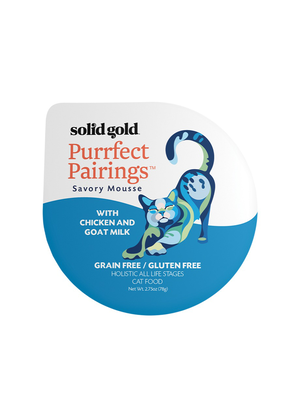 Solid Gold Purrfect Pairings Savory Mousse With Chicken and Goat Milk is formulated to meet the nutritional levels established by the AAFCO Cat Food Nutrient Profiles for all life stages. We'll begin this review of Solid Gold Purrfect Pairings Savory Mousse With Chicken and Goat Milk with a detailed discussion of the ingredients. The first ingredient is water sufficient for processing, which increases the food's moisture content. The second ingredient is shrimp. Although shrimp is an excellent protein and omega-3 fatty acid source, raw shrimp contains more than 60% moisture. After cooking, the relative meat contribution of shrimp is dramatically reduced. Therefore, it's important to ensure that other meat sources are included within the first few ingredients to ensure the product derives most of its protein from meat. The third ingredient is salmon. Salmon is another excellent protein and omega-3 fatty acid source. As with other raw meats, salmon contains a substantial amount of moisture and therefore the relative meat contribution of salmon is dramatically reduced after cooking. The fourth ingredient is tuna. Tuna is another outstanding protein source. Tuna also contains all of the necessary essential amino acids required by cats. The fifth ingredient is pea protein. Pea protein is produced by removing the starchy parts of peas. Pea protein is considered controversial because it provides a substantial plant based protein boost. This boost is undesirable because plant based protein is typically lower in biological value when compared to meat based proteins. Because ingredients are listed in order of pre-cooked weight, the remaining ingredients in Solid Gold Purrfect Pairings Savory Mousse With Chicken and Goat Milk are not as important as the first five ingredients. Next we have modified tapioca starch. Tapioca starch is a gluten-free starch extracted from cassava roots. Starch is a necessary component in producing kibble and tapioca is an excellent choice in this regard. The modified term indicates that the tapioca starch has been treated or processed in order to expose or improve some property. The next ingredient is chicken fat. Essentially fatty acids are crucially important for optimal health, chicken fat happens to be an excellent source of omega-6 fatty acids. Then we have goat milk. Goat milk is an easier to digest alternative to regular milk (i.e. cow milk). Moving on, we have tricalcium phosphate. Tricalcium phosphate is typically used for its mineral contents. However, it can also be used to evenly disperse fat in wet food products. Moving on with this review, we have salt. Salt is an important mineral for both humans and cats. Depending on the quantity of salt used (which we cannot determine), salt may or may not be a nutritious addition in the recipe. The next ingredient in this review is potassium chloride, which is a potassium supplement. The remaining ingredients in this Solid Gold Purrfect Pairings recipe are unlikely to affect the overall rating of the product. 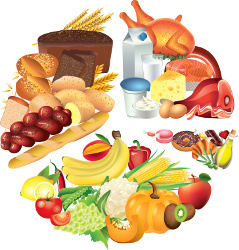 Our analysis of the ingredients show that this product derives most of its protein from animal based sources. This is an excellent property because meat based protein contains all of the necessary amino acids required by cats. In our option, this is one of the most important properties to judge when reviewing pet food, therefore we believe this is an exceptional product in this regard. The official PawDiet rating for Solid Gold Purrfect Pairings Savory Mousse With Chicken and Goat Milk is 2.5 out of 5.